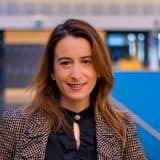 Giulia Calabretta (PhD) is associate professor in Strategic Value of Design at Delft University of Technology, faculty of Industrial Design Engineering. Giulia believes that design and design practices are the right way to go for making companies more innovative in their DNA and prepare them for the behavioral, technological and cultural revolutions of the future. Therefore, her focus in her research, teaching and consulting activities is to understand how design practices and capabilities can be effectively and permanently integrated in the innovation strategy and processes of companies. Additionally, she is interested in what makes a great Chief Design Officer and why each company (and institution) should have one. Her research has been published in top academic journals in the field of design and management. She is also the co-author of the successful book Strategic Design: Eight practices every strategic designer must master. She is a regular speaker at academic and practitioner conferences. She also frequently gives workshops and executive courses on strategic design and design leadership in innovation.